5 5 Structural Deficit – How did we get here? The structural deficit largely is attributed to the following: 1. Increased costs for retirement, salaries, and health care. 2. 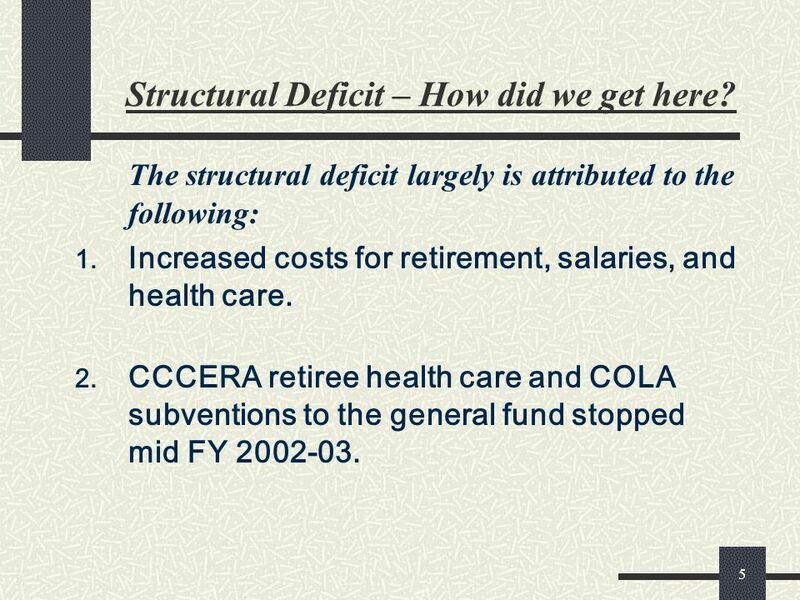 CCCERA retiree health care and COLA subventions to the general fund stopped mid FY 2002-03. 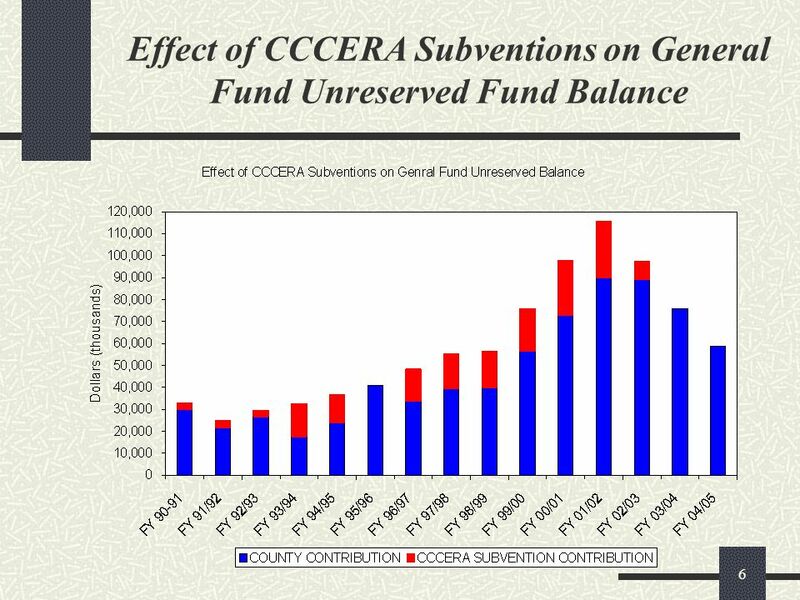 7 7 Unreserved Fund Balance The Government Finance Officers Association (GFOA) formally recommends that the minimum level of unreserved fund balance in the general fund be no less than 5 to 15 percent of general fund revenue. 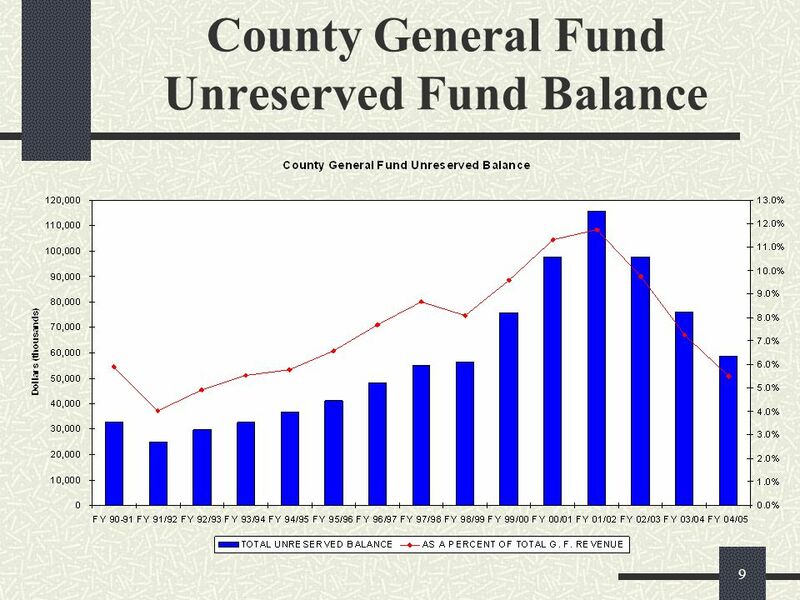 The County is consuming fund balance at a rate of $20 million per year. 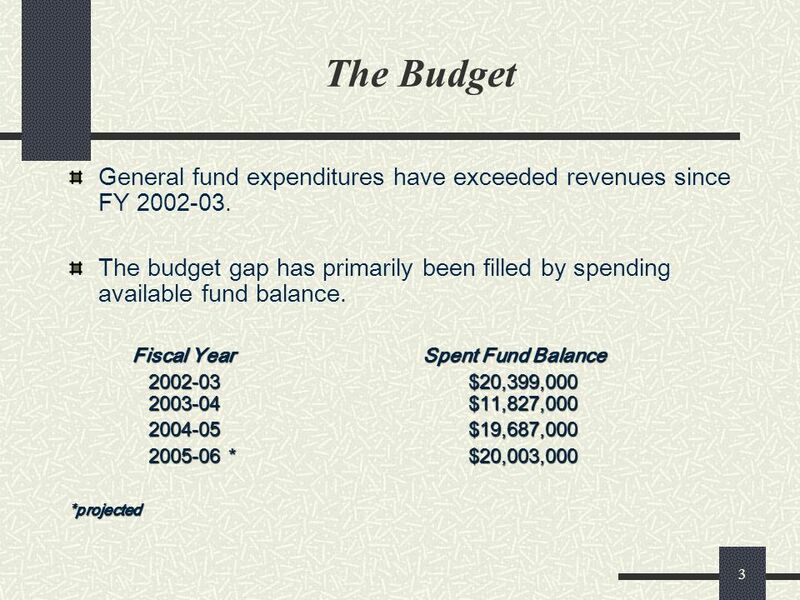 At this rate, the general fund balance will be zero by the end of FY 2007-08. 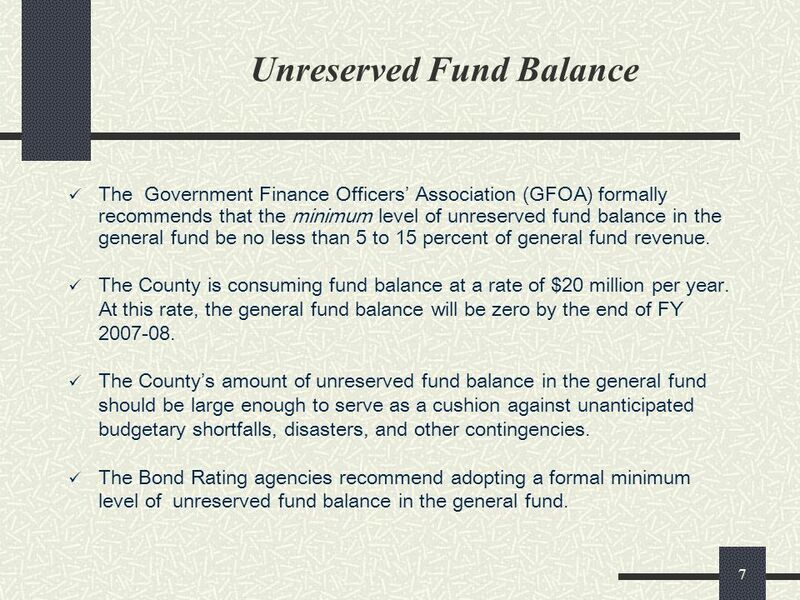 The Countys amount of unreserved fund balance in the general fund should be large enough to serve as a cushion against unanticipated budgetary shortfalls, disasters, and other contingencies. The Bond Rating agencies recommend adopting a formal minimum level of unreserved fund balance in the general fund. 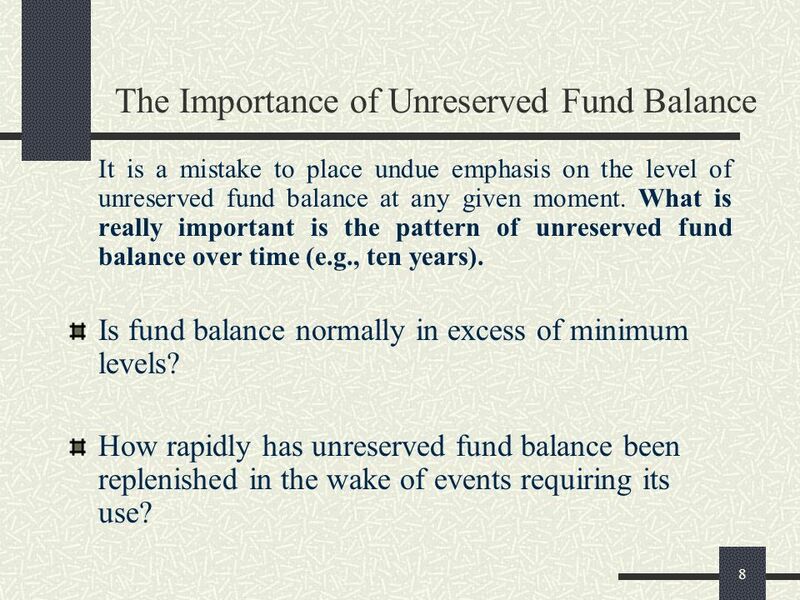 8 8 The Importance of Unreserved Fund Balance It is a mistake to place undue emphasis on the level of unreserved fund balance at any given moment. What is really important is the pattern of unreserved fund balance over time (e.g., ten years). Is fund balance normally in excess of minimum levels? How rapidly has unreserved fund balance been replenished in the wake of events requiring its use? 10 10 GASB 43 & 45 GASB 43 & 45 – Other Post Employment Benefits (effective FY 2007-08) Requires that the annual retiree health care costs beyond pay as you go be recorded as a long-term liability in the Comprehensive Annual Financial Report (CAFR). An agency may choose to fund (i.e., set aside assets) or not to fund this liability. 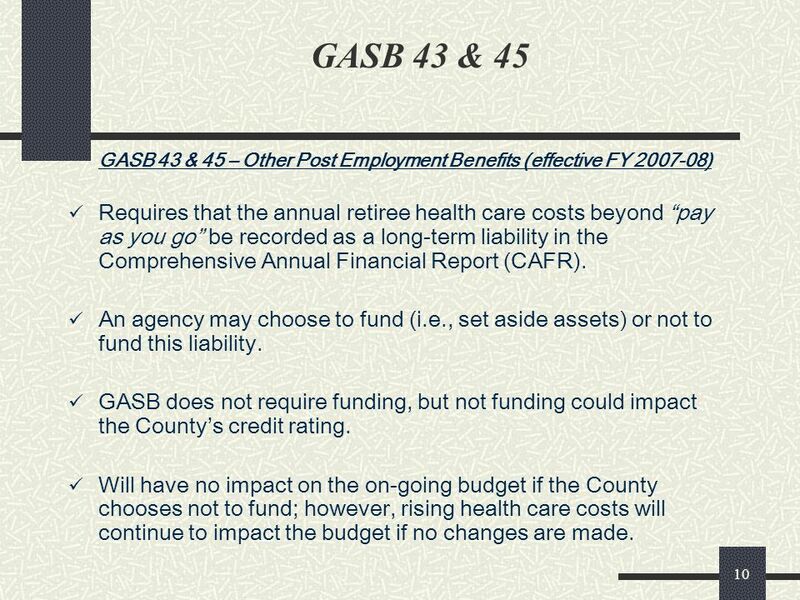 GASB does not require funding, but not funding could impact the Countys credit rating. 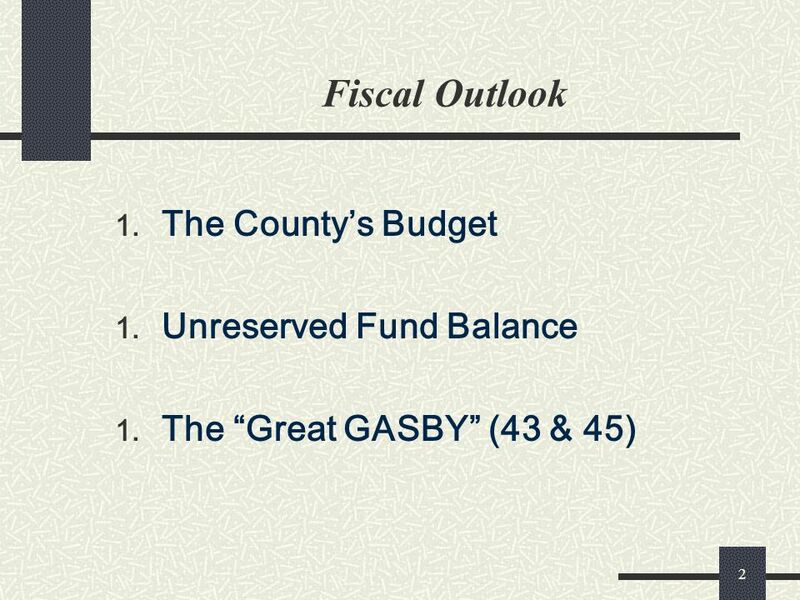 Will have no impact on the on-going budget if the County chooses not to fund; however, rising health care costs will continue to impact the budget if no changes are made. 11 11 Recommendations 1. Adopt a budget that is BALANCED Expenditures = Revenues 2. 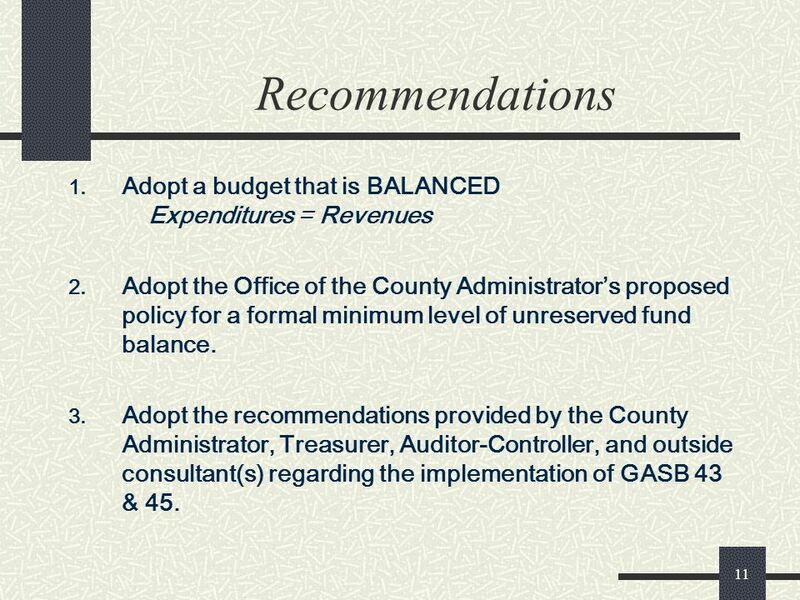 Adopt the Office of the County Administrators proposed policy for a formal minimum level of unreserved fund balance. 3. Adopt the recommendations provided by the County Administrator, Treasurer, Auditor-Controller, and outside consultant(s) regarding the implementation of GASB 43 & 45. 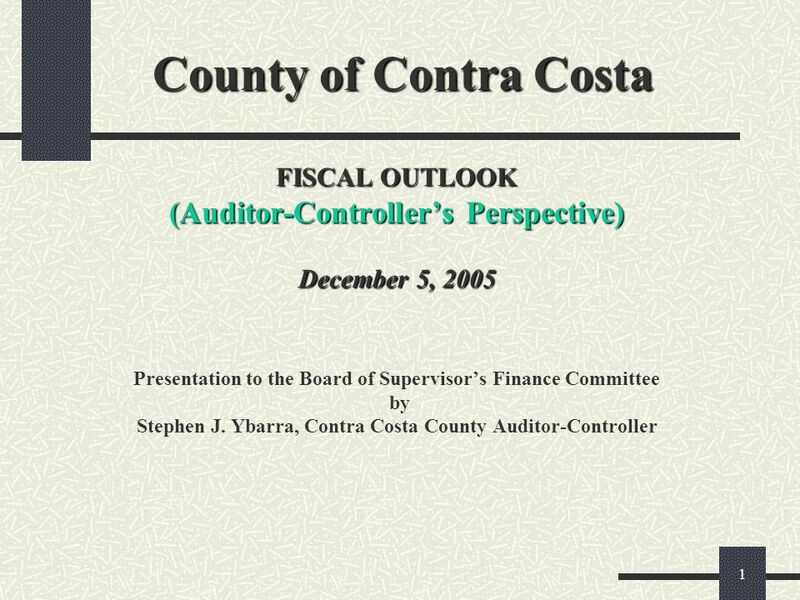 Download ppt "1 County of Contra Costa FISCAL OUTLOOK (Auditor-Controllers Perspective) December 5, 2005 County of Contra Costa FISCAL OUTLOOK (Auditor-Controllers Perspective)"
Washoe County Comprehensive Annual Financial Report for the Fiscal Year Ended June 30, 2005 Report to the Board of County Commissioners Presented by Katherine. Oakland Unified School District Long Term Obligations May 8, 2008 Ruth Alahydoian Vice President KNN Public Finance. Adopted Budget Oakland Unified School District Javetta Robinson, CFO Terrie Williams, Executive Officer of Finance Board of Education Meeting. Every student. every classroom. every day. SUMMARY OF OUSD INITIAL PROPOSALS TO OEA January 30, 2008. Budget Outlook House Committee on Appropriations Office of Program Research December 2, 2004. 1 State Fair Park Legislative Audit Bureau November 2004. Fund Balances What are fund balances? Why does _____ ISD maintain a fund balance in the General Fund? NI Executive Budget 2010 Pre-Consultation. Outline Background and Context UK Fiscal Position Implications for NI Budget Way Forward Key Questions. 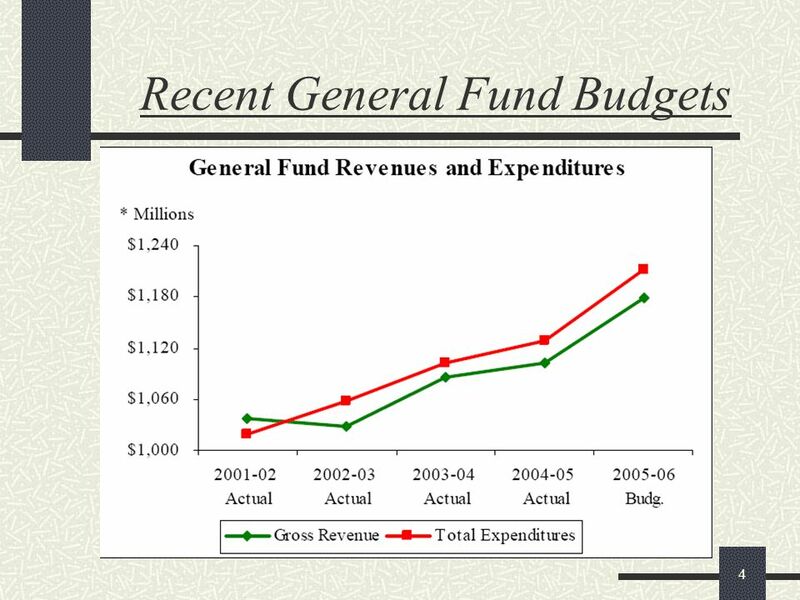 1 The Comprehensive Annual Financial Report Department of Administration Division of Executive Budget and Finance State Controller’s Office April 2003.